The office of Inspector General Police Islamabad recently circulated a notification to SSPs, all Zonal SPs and SHOs of Islamabad, warning all ‘pot-bellied’ SHOs to lose weight within a month or ‘get ready’ to face serious consequences. 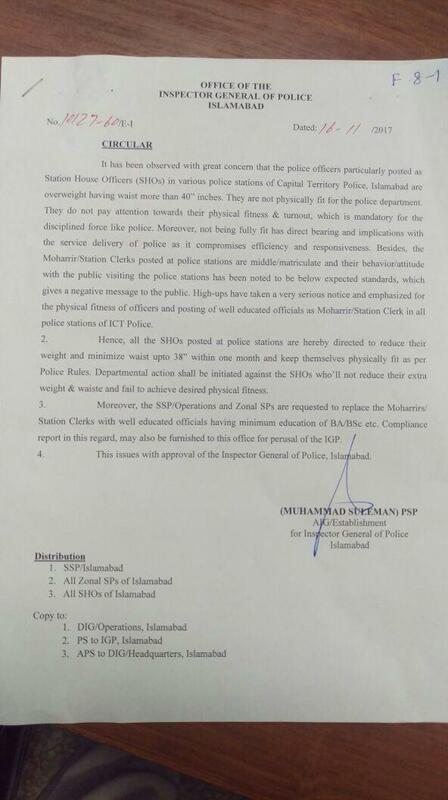 “It has been observed with great concern that the police officers particularly posted as SHOs in various police stations of the capital police are overweight having waist more than 40 inches. They are not physically fit for the police department and do not pay attention towards their physical fitness and turnout, which is mandatory for the disciplined force like police,” reads the notification issued by the IGP Islamabad. The circular claimed that most of the policemen posted at various police stations of Islamabad are obese and have waists way more than department’s standard size. It’s odd that such a notification was circulated when the city’s police is in a state of emergency trying to manage the protesters stationed at Faizabad and its surroundings. If the situation persists, the policemen won’t even get a chance to rest let alone work on their fitness. Some are terming this notification as a misjudgement in priorities. According to the Forbes’ list of fattest people, Pakistan is ranked at 165th position, with over 22% of the population considered obese, despite the reports that suggest nearly 39% of Pakistanis live in multidimensional poverty. There’s a Maal-e-Haram in it. On the contrary, Everyone needs to stay healthy and smart specially our armed forces. They can not chase any robber or criminal with this extra 50 Kilo stomach. I think its a good step to warn every Police officer to reduce their weight at some aggregate number.